When considering bedtime habits, new parents are often faced with a question: to co-sleep or not to co-sleep. While it’s a question as old as time itself, the safest way to sleep with your baby remains a point of contention among caregivers across the globe. For decades, pediatric research has suggested that the best way for an infant to sleep is alone in a crib on their backs, but many moms and dads have recently reopened the discussion about safe infant-sleep. From social media platforms to mommy-blogs, the co-sleeping debate has been increasingly present in 2018 media. While the American Academy of Pediatrics continues to publish studies on healthy infant-sleep practices, families explore a variety of co-sleeping methods. Although the AAP does advise against bed-sharing, some research encourages new mothers to sleep with their babies for mutual physiological support and optimal breastfeeding. To better understand the polarizing perspectives within the world of infant sleep, I spoke with various experts as well as a mother experienced in co-sleeping. Simply put, co-sleeping is the practice of sharing a sleep space with an infant. While many folks might use the terms co-sleeping and bed-sharing interchangeably, they are not synonymous. Co-sleeping can mean room-sharing, wherein the infant sleeps in the same room as the caregiver, but not in the same bed. Or, it can mean fixing a bassinet to the side of the parents’ bed so the baby is close, but still apart. Room-sharing, on the other hand, is widely considered to be the best and safest way to co-sleep. 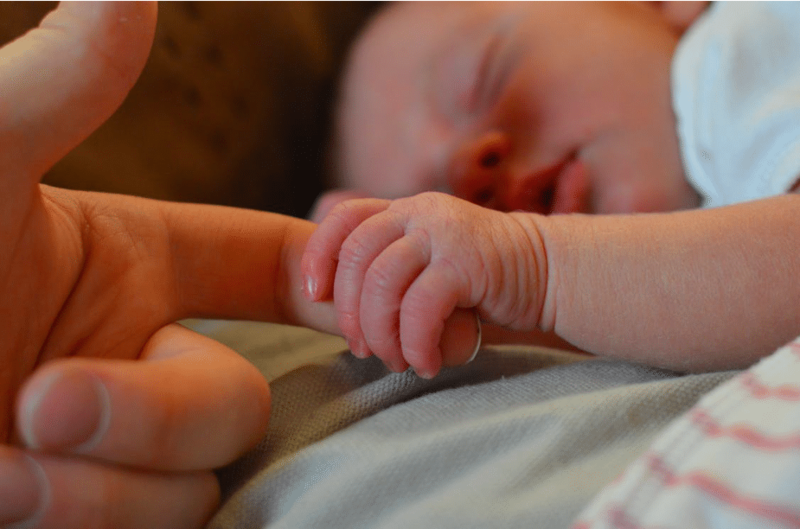 The AAP maintains that having a baby in their own bed, but within arm’s reach of the parent is the ideal sleeping arrangement as it allows for the close contact that newborns need without the dangers that come from sharing a bed. Many studies have found that cuddling with your baby is worth more than just bonding; early skin-to-skin contact can improve an infant’s physical health as well as boost their intelligence. Not to mention, sleeping with your baby nearby can help parents and infants to socially and psychologically “attach,” which serves to strengthen the baby’s budding psychological system. There is a good deal of evidence that supports the mutual benefits that stem from sleeping close to your baby, and some medical professionals argue that we’ve been evolutionarily primed to co-sleep. To lessen risk of suffocation, infants should always sleep on their backs. To contextualize this primal urge in the modern age, I interviewed a mother who began bed-sharing immediately after birth. She agreed to share her experience with me, but requested to remain anonymous. Justifying her fears, studies have reported a much higher rate of SIDS in infants who share a bed with their parents. While there are ways to mitigate the risk of bed-sharing, there is no known way to eliminate it completely. Schunn told me that there’s an easy way to remember the safest way for a baby to sleep — just follow the ABCs: Alone, Back, Clutter-free. This means that the baby should be alone, in the supine position, and on a safety-approved mattress with absolutely nothing else inside the crib. While this is the method approved by the AAP, some researchers assert that the benefits of bed-sharing are worth exploring, if done safely. If bed-sharing, all blankets, top sheets, and pillows must be removed from the mattress. Supine Sleep — No matter what, babies should always be sleeping on their backs to ensure that their faces are clear of anything that could obstruct their breathing, and to decrease the likelihood of rolling over. Firm Mattress — Soft mattresses or waterbeds are especially dangerous as the baby can easily sink in or roll over, leaving them more vulnerable to suffocation. The firmer the mattress, the less likely they will be to change positions during the night. Clean Space — While this may not be as comfortable for the parents, there should be no top sheet, no blankets, no pillows, no stuffed animals, or anything else in the adult bed that the baby could potentially roll into or be covered with. No Smoking or Alcohol — The influence of drugs or alcohol can affect a parent’s ability to wake up to notice their baby is in distress. It’s important to note that sleep deprivation can also mirror the effects of intoxication. While there are ways to make an adult bed less dangerous for a baby, medical professionals are generally in agreement that the risk of infant death still remains. Pediatric research uniformly advocates for intentional touch and physical bonding between parent and child, and Schunn asserts that parents should do this as much as possible “while they are awake.” But because of the strong correlation between SIDS and bed-sharing, the AAP consistently recommends that parents sleep with their babies close by, but never in the same bed. Note: The content on Sleepopolis is meant to be informative in nature, but shouldn’t be taken as medical advice or take the place of medical advice from a trained professional. Consult with a qualified medical professional to help determine the best sleeping arrangement for you and your baby.